New Belgium 1554 - My New Favourite! 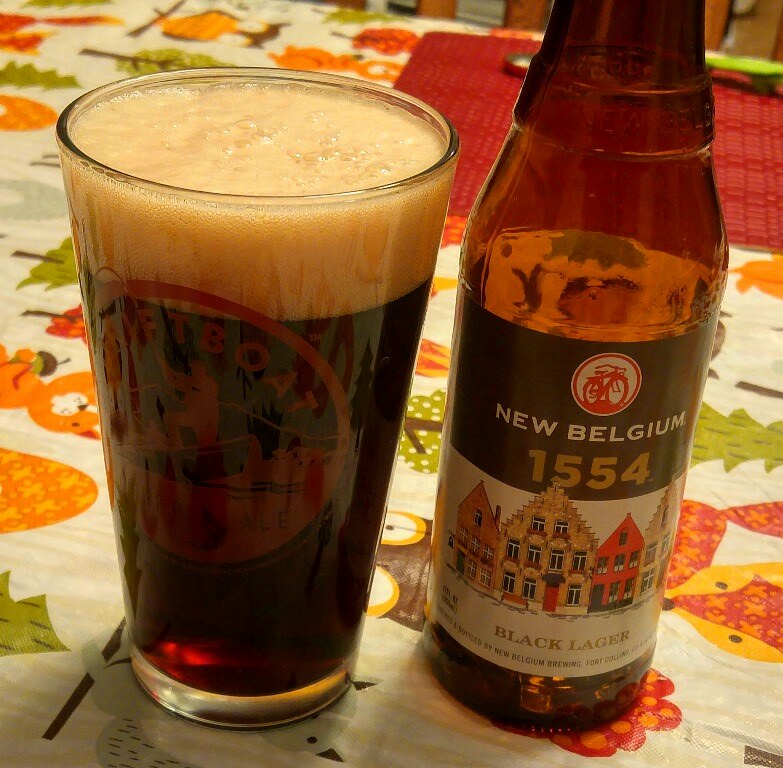 Quote Reply Topic: New Belgium 1554 - My New Favourite! In 1997, a Fort Collins flood destroyed the original recipe our researcher, Phil Benstein, found in the library. So Phil and brewmaster, Peter Bouckaert, traveled to Belgium to retrieve this unique style lost to the ages. Their first challenge was deciphering antiquated script and outdated units of measurement, but trial and error (and many months of in-house sampling) culminated in 1554, a highly quaffable dark beer with a moderate body and mouthfeel. the first thing i thought was "CARBONADE!" and intend to try it in one as soon as i can. I am hoping that using this ale will put me very close to something that would be original and akin to what folks were enjoying a couple of hundred years ago. Braised Dietzler Farms organic shortribs, turnip greens, cranberry beans, chestnut puree. Rich malts and chocolate play perfectly with the braised red meat (or any meat). Lots of thyme, tomato and garlic (in the braise with the 1554) are integral to deepening the flavors of the malts. Peppery bitterness from the greens offset some of the sweetness of the malts. Cranberry beans (named for color only) are rich and creamy and complement the chestnut puree with their earthiness and richness, enhancing more of the malt flavor. This dish really pulls out the beer. 1554 has so much going for it that there is room all over the tasting wheel to find wonderful matches and contrasting goodness. Try disparate types of cheese as a perfect way to capture the elusiveness of this beer. The fact that a super creamy Havarti or a lighter blue such as Point Reyes Blue are both perfect shows the ability of this beer to be a chameleon. 1554 is a dark beer enthusiast's summer dream. It has all the malty complexity of a dark beer, with that light bodied crispness of an easy drinking session beer. This combination makes it a terrific summer BBQ beer; it has enough gusto to stand up to the bold flavors coming off the grill, yet it remains light enough to drink a hundred of them in the backyard with your friends... responsibly of course. Here's what's on my menu: Grilled baby red potatoes with lemon and rosemary, balsamic braised beet greens, cedar planked Portobello mushrooms with a cherry barbeque sauce. For dessert, an amazing WaterCourse Bakery vegan HoHo. The balsamic braised beet greens are deliciously sweet and acidic, adding a bit of balance to 1554's rich malty character. The cedar planked Portobello is rich and earthy, which plays well with 1554 malty profile. The cherry BBQ sauce is just a little spicy but sweet, and no one can deny that cherries and chocolate are an irresistible combo. The WaterCourse bakery HoHo is a cream filled chocolate cupcake, and I can't think of a better beer to wash one down with than 1554, with its malty notes of chocolate and coffee. Meat stews, potato pancakes, chocolate cake, cheesecake. Me too, but I haven't seen it around here, even at the super-duper wine/beer/spirits place we have here. Maybe Ron is gonna be our favourite exchange package guy from now on! I checked their website John, and it is available in MO...alas, I'm out of luck here in new england. if no one can find it, i'll see what i can come up with! Well thanks for checking Dave! This afternoon I went to the super duper wine and beer place and though they have literally two hundred differnt beers, unfortunately I could not find this one. Looks like I'll have to ask the beer delivery guy at the grocery store to see what they can get and stock. While I was there I did run across Boulevard Brewing Company's (Kansas City) Oktoberfest beer called "Bob's '47"...named after Bob one of the brewmasters who won an award back in 1947. This is delicious stuff, and seasonal so we only get to enjoy it this time of year. Picked up a six and am drinking one now! Well well well! Went to the grocery store this morning to pick up some items for supper and took a cruise by the beer cooler. What did I see but 1554 Black Ale finally featured and on sale at $6.59 a six. Woo-Hoo....so of course I grabbed on for the games this afternoon. Wonderful stuff....light-bodied for a dark beer, refreshing. It is well hopped, giving it a nice tang. Overall the flavor reminded me of a heavily hopped Smithwick's ale. Very tasty!